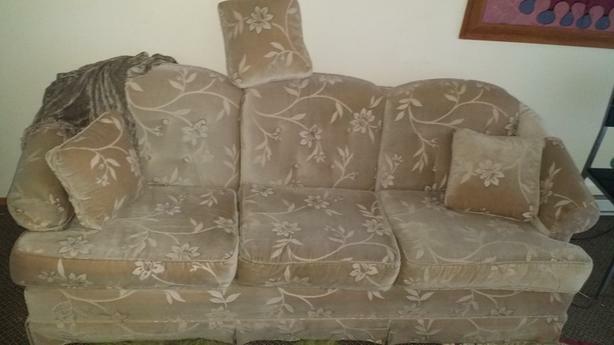 Soft velvet comphy like new 3 seater sofa made by Horizon in California. Hardly used no wear or tears in fact mint condition. There is a really lovely shimmer to this material!! Pastel colors in creme, pale streaks of blue & pink in leaf pattern reflect in light & blend into any surroundings. Includes 3 cushions & 2 arm covers. Firm comfortable cushions no sagging... Only $400. Please phone 250-868-9779 to view in Kelowna anytime. Sorry but no deliveries.Thanks!